Top British scientists are backing an international campaign to stop the United States obtaining a worldwide ban on all types of human cloning. The Royal Society is among 68 academies urging the UN to ban reproductive but not therapeutic use of the technology. President George Bush's administration wants a complete ban, which the UN could introduce as early as October. Member states would not be compelled to sign up but scientists fear such a treaty could stifle stem cell research. Professor Richard Gardner, chairman of the Royal Society's working group on stem cell research and cloning, said: "It is clear that if the UN bans all forms of human cloning, the UK, and other countries which currently permit carefully regulated therapeutic cloning, will not sign up to it." Scientists who oppose a complete ban believe it could backfire by halting efforts to stop maverick cloning scientists. Prof Gardner continued: "To effectively stop cowboy cloners claiming that their work on human reproductive cloning is acceptable, because it is not outlawed throughout the world, a UN convention must be passed that all countries are willing to endorse." He said a clear distinction by the UN between reproductive and therapeutic cloning would "provide invaluable guidance in passing effective legislation". He added that it should be noted the US had not yet banned reproductive cloning because of its attempts to include therapeutic cloning in the ban. Last year, the UN, which could introduce a ban at its 59th General Session in October, voted by a slim margin to postpone the decision, despite powerful lobbying by the US. 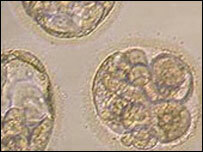 Earlier this month, scientists from the University of Newcastle were granted a licence to clone human embryos in the UK for medical research. Stem cells from early embryos could potentially be used to provide new treatments for incurable diseases such as Alzheimer's, diabetes and Parkinson's. "Opponents say even therapeutic cloning... is unethical"